Wasp has announced the release of their MobileAsset v7 and MobileAsset.EDU. Wasp’s fixed asset tracking solutions include all the features a business or educational institution needs to account for its valuable assets. 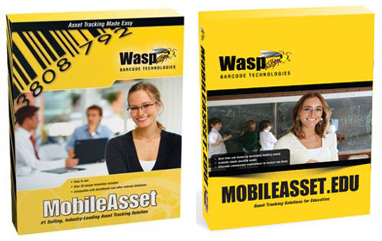 Wasp’s MobileAsset v7, designed for IT departments, and MobileAsset.EDU, dedicated for K-12 and higher education institutions, are the most convenient and competitive tracking solutions available. The MobileAsset.EDU edition is the first of its kind, with two available options, Professional and Enterprise; while the MobileAsset v7 is available in three editions: Standard, Professional, and Enterprise. MobileAsset v7 boasts an easy-to-use interface, with a customizable dashboard, designed to meet the needs of small businesses, departments within large enterprises, government agencies and healthcare organizations. MobileAsset v7 takes asset tracking to the next level with iOS and Android compatibility to make tracking and locating a company’s assets easier and more flexible, while maintaining a competitive market price. MobileAsset.EDU, designed to track assets purchased with grants, allows users to easily audit purchased assets for accurate information regarding current and available funds for each grant or funding source. Also, the asset tracking system provides maintenance schedules, so each asset is adequately updated to the standards set via grant agreements. For more assistance finding the right asset tracking solution for your specific needs, contact us at BarcodesInc.